StrandVision Helps McLean Implement "Make the Wait Worthwhile"
Home > Digital Signage > Industry Solutions > Overview > Industrial Distributors > StrandVision Helps McLean Implement "Make the Wait Worthwhile"
McLean Implement, Inc. is a John Deere Gold Star dealer serving Illinois, as well as international markets, through locations in Albion, Benton, Flora, Norris and Wayne City. The dealership sells new and used equipment and is focused on customer service through its responsive parts and service operations. 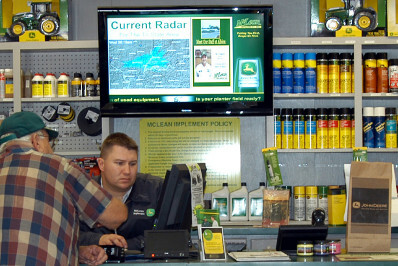 Recently, McLean enhanced its customer service offerings by adding digital signage from StrandVision at the parts counters of its four agricultural locations. The signage is entertaining and keeps customers informed as they are being served. McLean Implement, Inc. is a Gold Star John Deere dealership with 85 employees that serves southeastern Illinois. Always on the lookout for better ways to serve customers, General Manager Mike Clark regularly tours other dealerships. He noticed that some of the agricultural distributors had televisions behind their counters in their customer service areas playing local news and advertising. This seemed like a pretty good way to fill wait time. As Mike explained, "Customers don't arrive in the best of moods. They're frustrated. They're at our parts counter because something broke down. I noticed that they're attracted to the TVs and the frustration melts away. They get to see news and weather and market information while they're waiting." Mike started to look into setting up a system. He first considered using a PowerPoint presentation that would be duplicated for each location. "We started looking at how to connect remote locations and discovered that it would not be easy and would require a lot of staff time." He mentioned his plans to Kevin Leslie of Leslie Enterprises Inc., a company with strong experience in radio, television and security communications. Leslie Enterprises had previously installed a conference room audiovisual system at McLean. Kevin recommended StrandVision. "The ease of use was apparent," said Mike. "It was worth the money and would also make it easy for us to combine general and agricultural market news, weather and advertising." Kevin installed 40" LCD screens at the four main locations' parts counters. McLean used existing PCs to drive the digital signage and hooked the units up to each location's existing Internet connection. Kevin established the account with StrandVision and got the signage going. He also set it up so the signage would be displayed in a frame on McLean's website. He designed the page template and created the first presentation, including news, weather and promotions. Mike added a page to preview and promote John Deere Day in mid-May. The signage is working. "People in the store see the John Deere Day promotion and ask questions about it. That tells me that the digital signage is effective. I know it's reaching them." McLean has big plans now that the planting season is over and they have a little more time to experiment with the new system. They'll be adding and enhancing the photos and mixing in videos of their equipment at work. "We plan to have a lot of video of local farmers using our equipment in the fields. Customers will get to see themselves up there," said Mike. They are also planning to offer point-of-sale discounts and coordinate the digital signage with McLean's other direct mail, Internet and advertising promotions. Mike especially likes StrandVision's Web feature. "We love that. All we have to do is modify our signage and the website is automatically updated, too. There's a certain Wow factor for the customer. Based on the reaction from the John Deere Days promotion, I really feel it's worth our money and that our digital signage will be effective."